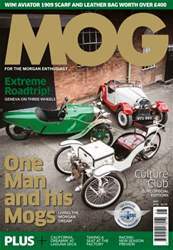 We've gone for the classics in MOG this month, starting with a collections of cars owned and restored by one of Morgan's key employees. We also look at the special edition Morgans and why they're important to the brand, both at home and abroad. If a road trip is more you style, we've got you covered. We follow the progress of the #3WheelArt Morgan's journey from Malvern all the way to Geneva! Plus, as ever, there's a lot more besides.